Whether you've got chronic pain that you haven't been able to fix despite your best efforts or you're an athlete looking to improve your mobility for your sport, we take pride in delivering efficient (i.e. 15-20 minute routines you can do at home) and effective courses to help you reach your goals. Traditionally, most people start their journey with one of our targeted programs as they're a great way to become familiar with Precision Movement methods and terminology. If you've got tight shoulders, the Shoulder Flexibility Solution will help you zero-in on your biggest limiting factor via a quick assessment, after which you'll be prescribed specific routines to help you gain ranges of motion that you may not have had in years. Everyone from office workers to professional MMA fighters have successfully used the Hip Flexibility Solution to unlock their tight hips. Tight hips can hold you back from being able to execute fundamental movements like squats, lunges and deadlifts with proper technique, contribute to low back and knee pain, prevent you from realizing your athletic potential and worst of all - can leave you feeling old and stiff. ​If you're suffering from chronic pain in your tensor fasciae latae (TFL) muscle, restoring proper function to all muscles of the hip - not just the glutes - is the path to lasting relief and the 2-phase TFL Pain Solution will do just that. The Control series includes 5 x 12-week courses designed to restore optimal function to every area of your body in a systematic way: spine, hip, shoulder, upper limb (elbows/wrists/hands) and lower limb (knees/ankles/feet). If your ultimate goal is movement longevity then you will want to complete every course as you'll leave with a full understanding of what your body is capable of, what it can do right now and how to train it for optimal function so you can get back to and keep doing the things you love. Whether you want to be finally rid of chronic low back pain or you want to get your spine moving the way it's designed to, Spine Control's got your back and will restore lost ranges of motion in a safe and progressive way. The common lower body exercises we do neglect 3 important muscle groups leading to muscular imbalances, pain and tightness. Hip Control will restore muscular balance and function and improve your mobility and strength. The shoulder is the most complex joint designed for one thing: MOBILITY. Thing is, if your shoulders are tight, typical static stretching is the worst thing you can do for them as it'll decrease stability. Shoulder Control will teach you how to properly develop mobility for strong and healthy shoulders. When was the last time you trained your feet or ankles? While commonly neglected, they are your connection to the ground and if they're not functioning properly, it will result in compensation somewhere up the chain. Lower Limb Control will restore proper foot, ankle and knee function, ensuring you're moving with stability and control. If you've got recurring problems or tightness in your wrists or elbows, issues like tennis or golfers elbow or stubborn shoulder pain that hasn't responded to shoulder specific protocols, give Upper Limb Control a shot to fix these issues and more. If you're serious about being able to move freely and without pain for the rest of your life then you'll want to follow the entire Control series and integrate the other programs as needed. That's why I'd like to invite you to learn more about the Precision Movement Academy where you get access to every program and course and additional complementary content not found elsewhere to optimize your body for pain-free movement and mobility. 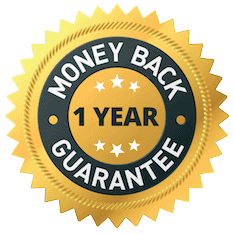 REMEMBER - you’re backed by our industry leading 1-year money-back guarantee, so you’ve got 1 full year to give any or all of our courses a try and if for any reason you're not satisfied, all you've got to do is email us and we'll refund every penny, no questions asked. That's how confident we are that our courses will deliver the results you're after. And more.